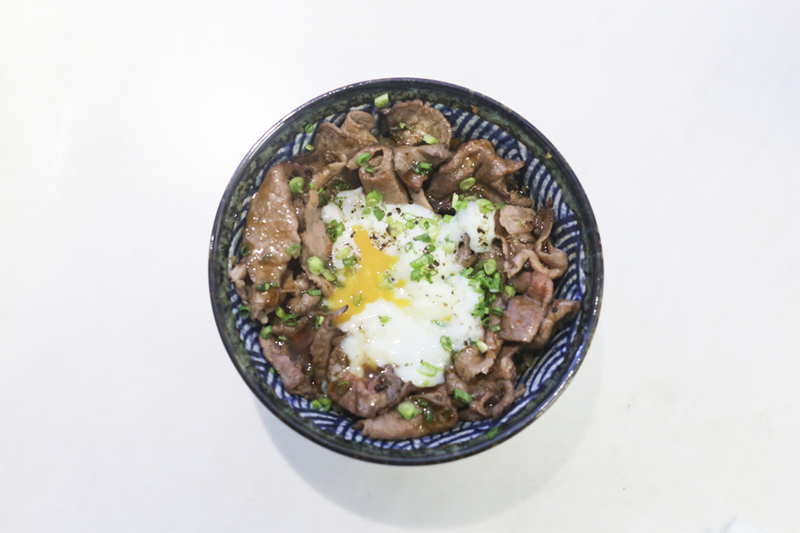 Gyudon 牛丼 which literally means beef donburi, is a Japanese dish consisting of a bowl of rice topped with beef. 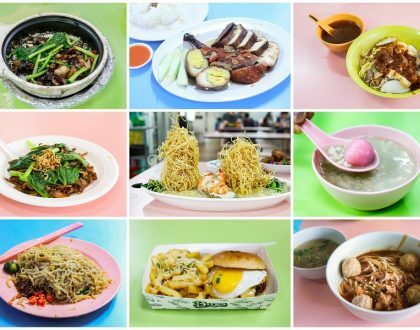 There are various versions available in Singapore, some cooked with simmered onions in a mildly sweet sauce; beef slices piled like a mini-mountain; or with grilled beef pieces typically added with a soft poached egg. 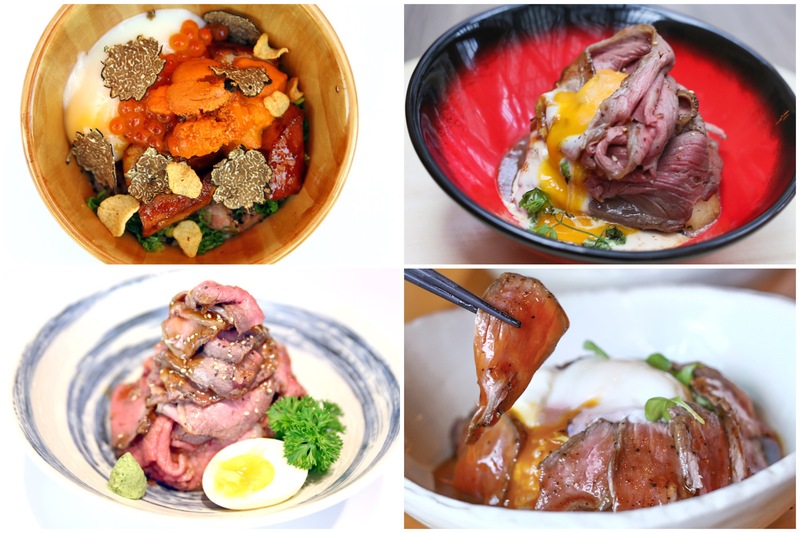 As my need for protein increases (because I am working out to lose weight), plus various players are churning out inexpensive, hearty bowls of Beef Donburi, I started to pay attention and tried quite a number of them. 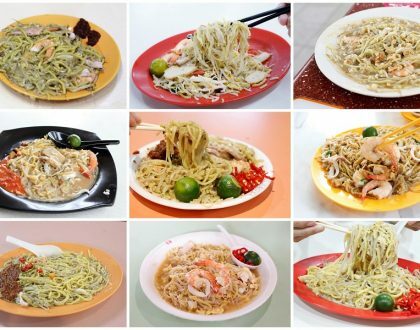 The appeal is that its both comforting and nutritious with ingredients such as beef, eggs and onions. Some have gotten more experimental and it is not difficult to find more luxe ingredients such as truffle and foie gras added. Sushi Murasaki at Millenia Walk is known for its omakase dining concept and seasonal fish freshly-flown directly from Japan’s famous Tsukiji Fish Market. But look out for THIS. Yes, this. 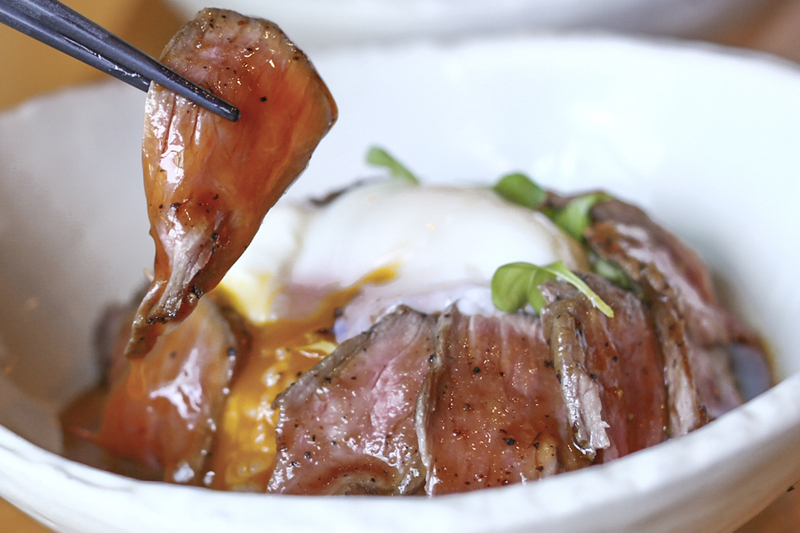 A Premium Wagyu Don ($85) that spells indulgence, sumptuousness and savour all at the same time. 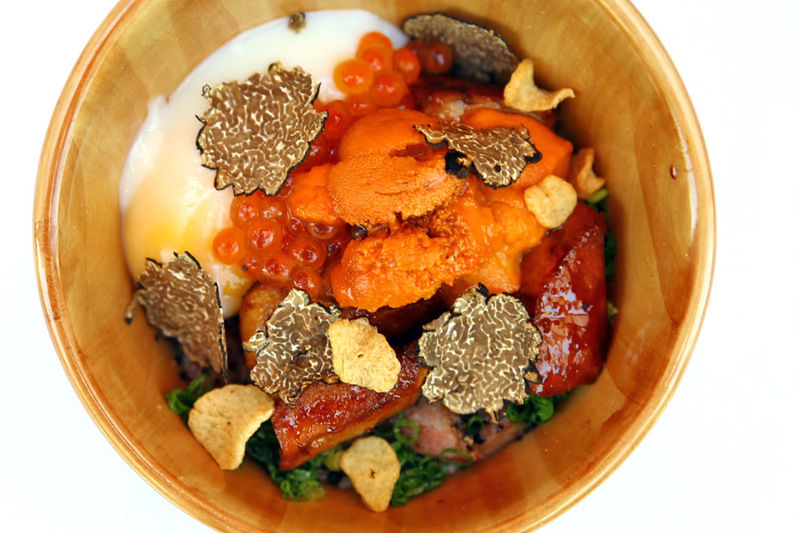 The Donburi includes Kagoshima Wagyu Beef, WITH buttery foie gras, uni, ikura, black truffle, onsen egg and further drizzled with truffle soy sauce. Every spoonful, you are consuming something luxe. Interesting. The word “Fat” in Fat Cow stands for luxury and indulgence, and is also a play on the word “Fatt” which in Mandarin dialect means prosperity. The Japanese restaurant is known to serve handpicked selection of the finest Wagyu from reputable farms around the world. 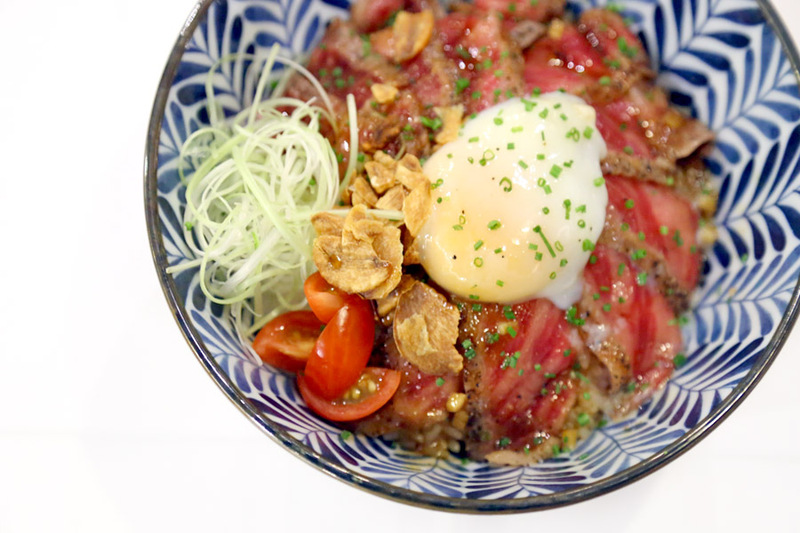 The Fatcow Premium Donburi is one of its signature items, also at a premium price of $98 – of sliced wagyu steak on rice, uni, caviar, foie gras and onsen egg. The buttery foie gras which melted in the mouth was surprisingly the best part; I did wish that the steak pieces could be tenderer – for the price paid. 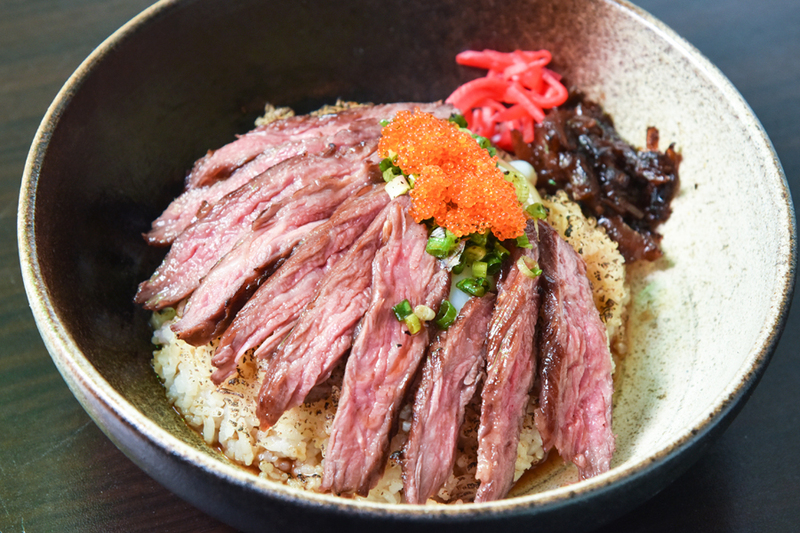 The Butcher’s Flaming Hokkaido Beef Bowl (starts from $11.90) incorporates premium beef imported from Hokkaido, in which the meat is first cut to thin slices, then neatly stacked over the Japanese grain rice like a mini-mountain. The rice is mixed with furikake for that added savouriness and zing. 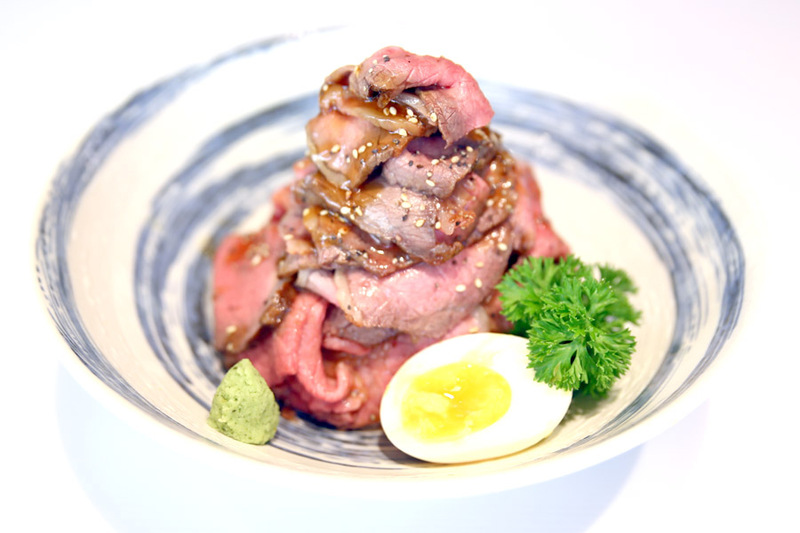 Hokkaido beef is used due to its tender and juicy quality, corresponding with suitable amount of fats for an enjoyable bite. At first I thought the dousing and flaming with the Cognac seemed a tad gimmicky (though I admit it is quite instagrammable), but it added this touch of caramelization, smokiness and subtle complex alcoholic taste. Sandaime Bunji established in Tokyo Ginza, is an 80 year old family business known for making Kamaboko — a fish cake snack. What really caught my attention was the Wagyu Round Roast Beef Set ($24.90), which came in a towering bowl with slices stacked above rice. The portion is generous with 250 grams of beef, tasty and tasty, worth every bit of its price. Kabuke is a 50-seater Sake gastrobar, so named as it combines the art of kabuki and the wonders of Japanese Sake. I was pleasantly surprised with the Gyudon ($15), which contained grain-fed striploin topped with onsen egg and garlic chips. Some other Gyudon I tried elsewhere tasted like beef on rice with some sauce, and that was it. 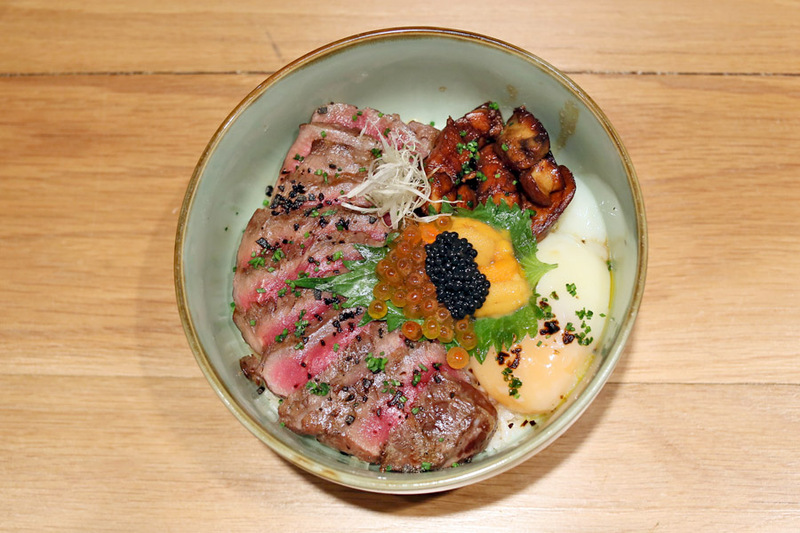 The Signature Truffle Wagyu Don ($12.90, $21.90) is a steal for its portion. For those who get a high from the scent of truffle oil (may it be real or not), you would get yours satisfied from this bowl. There was a strong smoked garlicky aroma in the midst as well, one of those bowls that worked on the scent element. I was also pleasantly surprised with the amount and quality of beef used, for that price – thinly sliced, meaty yet tender, in a good meal to rice ratio. Not exaggerating, this was one of the best beef bowl I had. Offering a variety of Japanese rice bowls and udon, the recommended ones were the Signature Wagyu Beef Rice Bowl ($9.90 for petite/ $17.90 for standard) and the Aburi Bara Chirashi Bowl ($16.90 for standard). 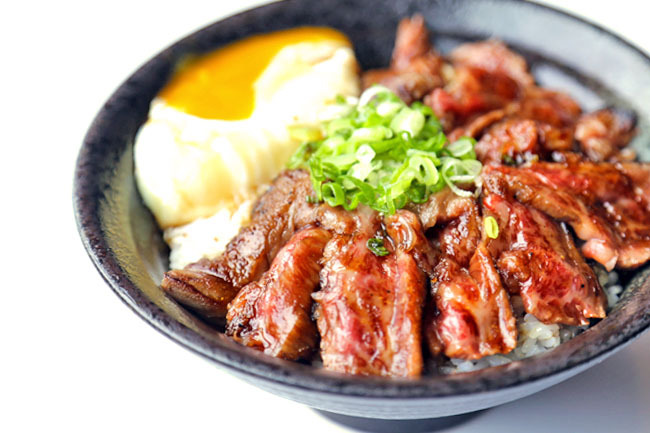 The Signature Wagyu Beef Rice Bowl ($17.90) arrived with strips of wagyu beef sous-vide and seared to a pinkish hue with a tender texture. Oishii! 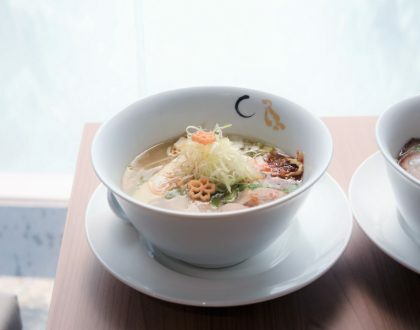 The Japanese fare created by Executive Chef Toshio Sawai offered here is quite extensive, from Sun Original Kamameshi, Bento sets, Kobachi, Sushi, Sashimi, Washoku combinations, to Steak dishes. The donburi sets at Sun with Moon Japanese Dining & Café have been popular among lunch-goers, and you can expect Unagi Don ($23.80), Tendon ($23.80) and Buta Don ($22.80) – pan-fried sliced pork served on rice. 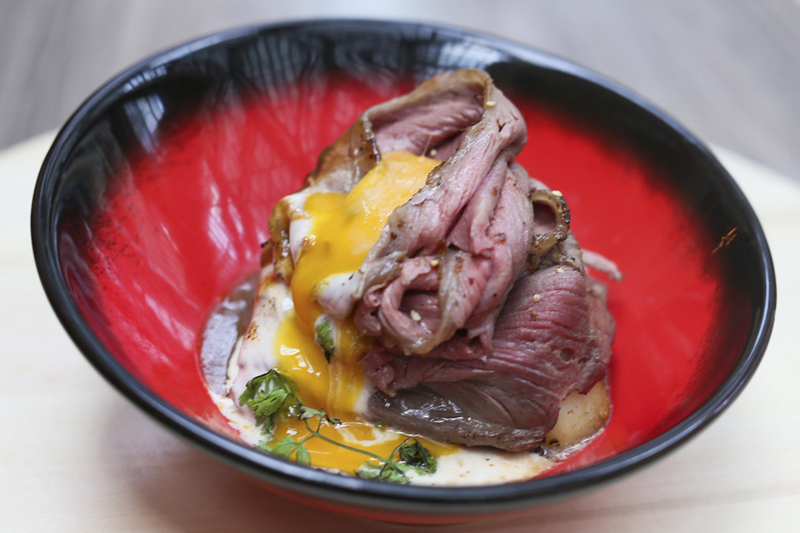 I would recommend the Roast Beef Don Set ($25.80) of sliced sous-vide tender roast beef served on Japanese rice with special sauce, mayonnaise, and topped off with a soft boiled egg. The portion is generous and makes for a satisfying meal. 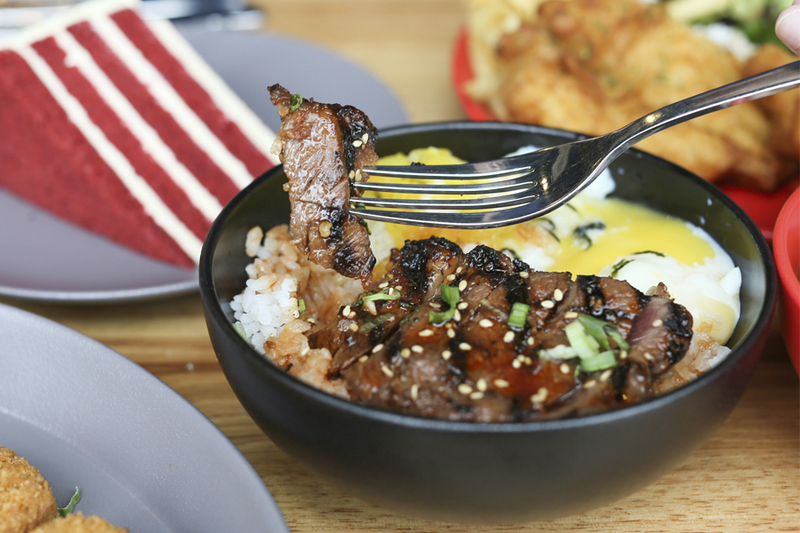 For those working around Paya Lebar who needs a protein fix or a fuss-free meal, you can go for the Yakiniku Beef Striploin ($8.50) at Nuevo Café. 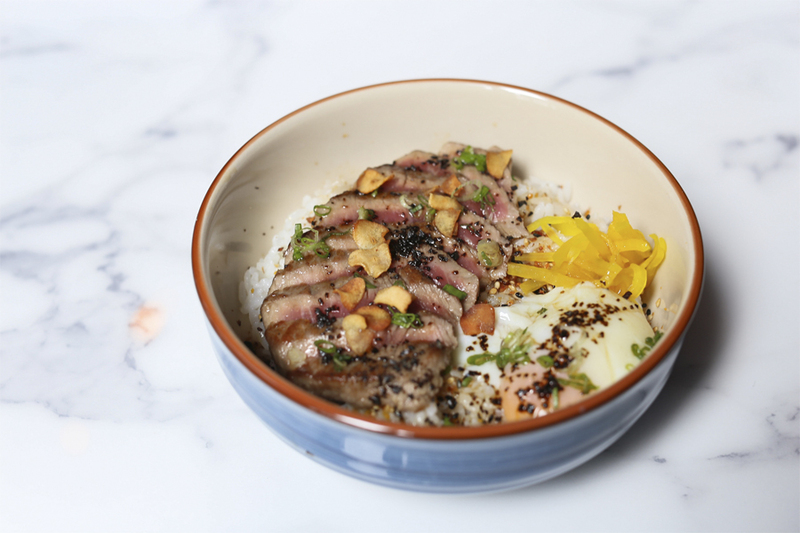 Served during lunch and dinner times, you get grilled beef striploin on a bed of Japanese rice, topped with pickles and sous vide egg, sprinkled with sesame seeds and roasted nori. Sushiro has opened a Ryori by Sushiro, which is more focused on Gyuniku Donburi. I opted for the Tokyo Gyuniku Don ($12). When I first tasted a few spoonfuls, I felt the meats were juicy enough. Compared to the usual donburis which are typically drier, their version was more soupy. Dude come on, gyudon refers to a really specific dish, not some kind of rice bow category. Always made with stewed thin slices of beef and onion, soy, mirin, sake, sugar, and always served saucy and with a side of benishoga ginger. 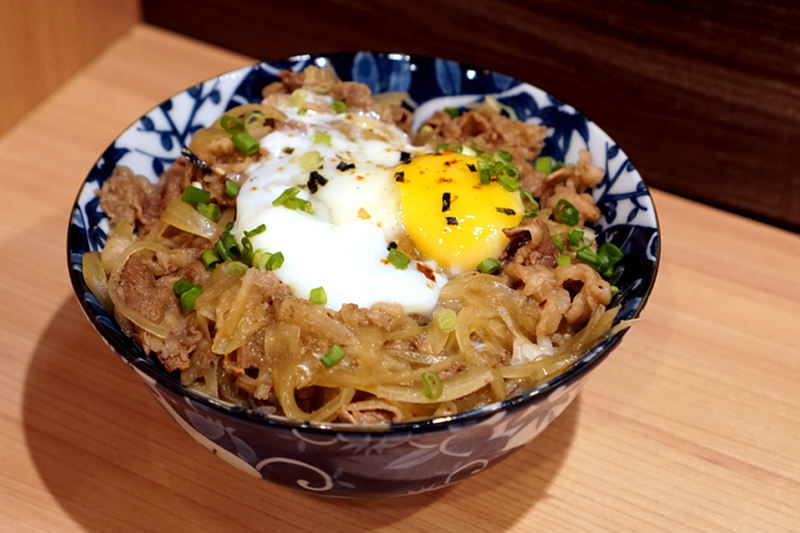 Japanese would not consider any of the above as a legit gyudon (except the last one). Anything with grilled beef should be considered a yakiniku don 焼肉丼. The roast beef don should be called as such (yes, roast beef don is an actual dish ロースビーフ丼), but none of these fall under some imaginary umbrella category called “gyudon.” Note how most of the dishes listed aren’t even identified by the restos themselves as a gyudon, but rather some other name. I know this outlet called DOCO, tbf, they’re are one of the best I’ve tried. They just opened like 3-4 months ago? Their takeaway would be the extra crisps that come with it!